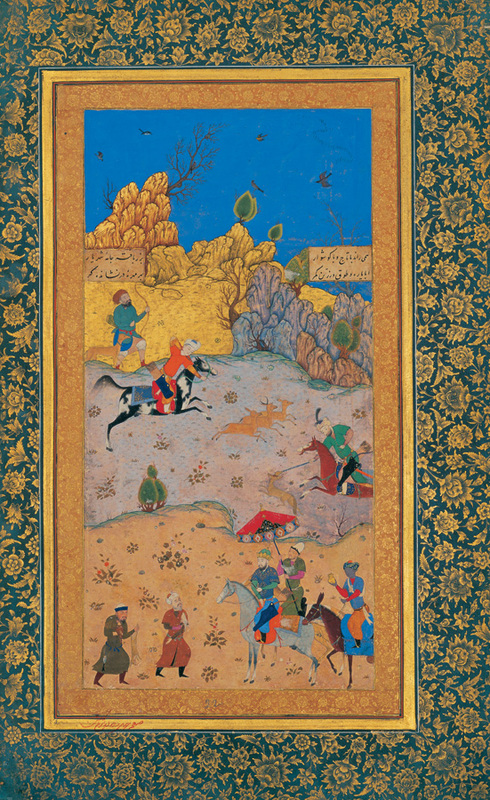 Kamal ud-din Behzad (کمال‌الدین بهزاد) is perhaps the most famous historical painter of Persian miniatures. Like most artists in the 1400s and 1500s, however, it’s important to remember that for much of his career he didn’t work alone but was the leader of a workshop (in this case a Persian scriptorium, a kitabkhāna) producing artworks under his stylistic direction. Persian miniature is a genre of painting wherein small pieces are created either as book illustrations or standalone pieces of art. 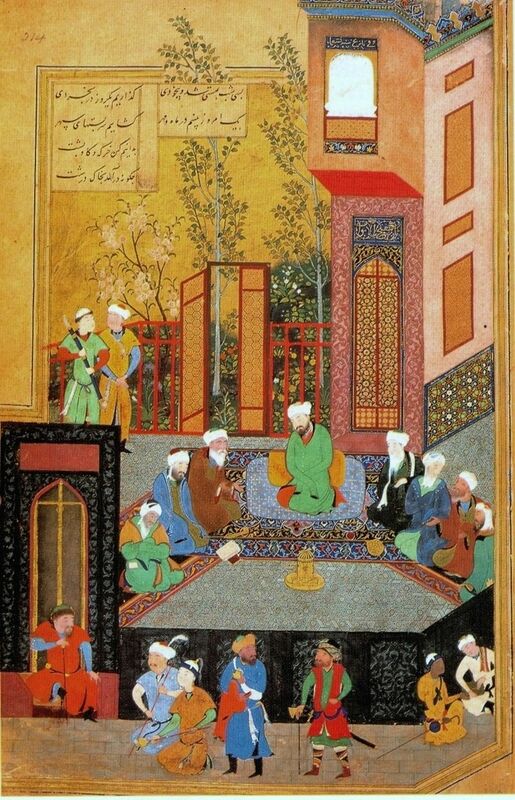 The miniatures that Behzad made were supposed to be kept in an album known as a muraqqa. A muraqqa contained collections of Islamic miniatures and calligraphy from various sources, and was the standard format for displaying miniature paintings in the Persian Safavid, Mughal and Ottoman Empires. When looking at Persian miniatures, the most important aspect to note is the size. The effect of looking at something so small is very different than looking at, for example, a large oil painting. Here’s something to remember when analyzing historical artworks: the bigger they are, the more public they are supposed to be, and the smaller they are, the more private and intimate. 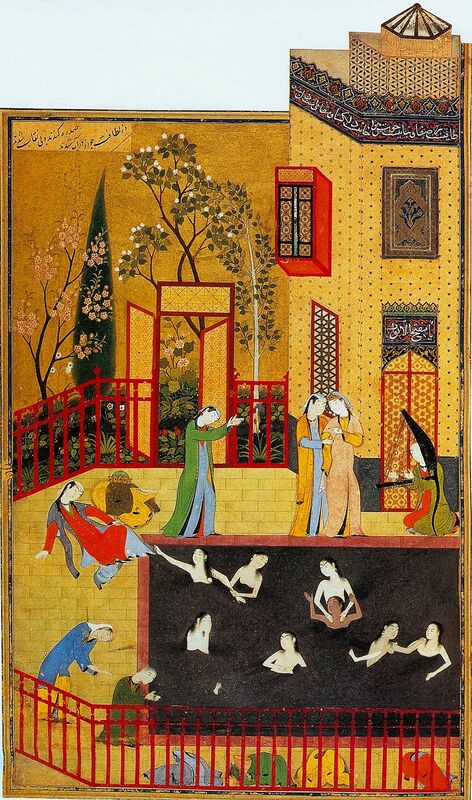 Looking at Persian miniatures, therefore, was supposed to be a one-person or small group activity. 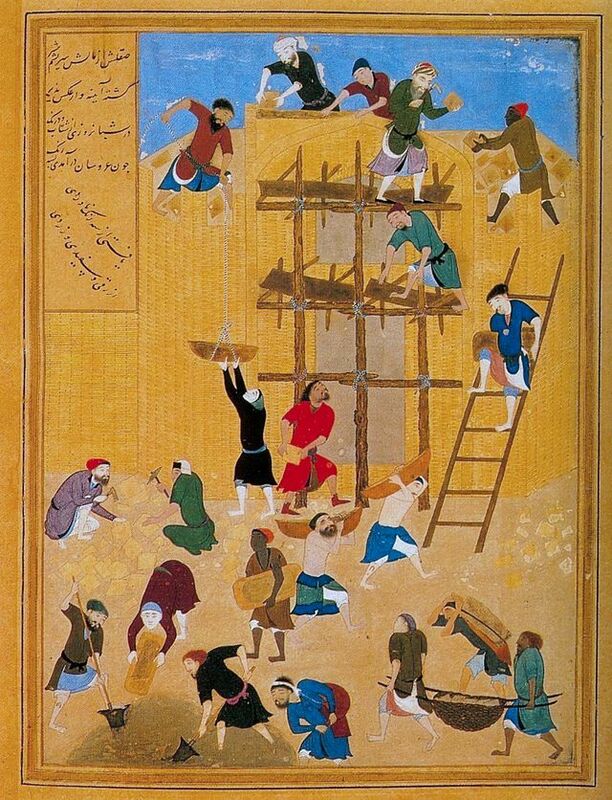 A miniature painting from Behzad’s version of the Iskandarnama (Book of Alexander the Great, known as Iskandar in Persian), year unknown. 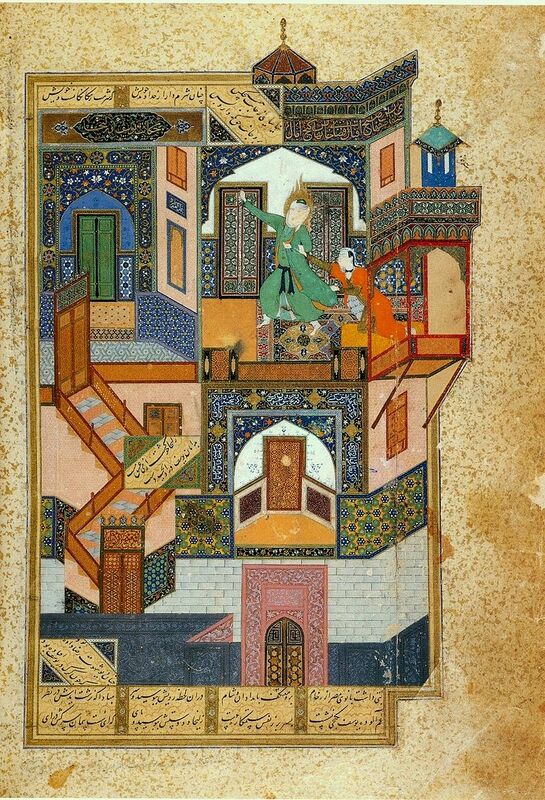 Another thing to note with Persian miniatures is the flatness of the perspective. While Renaissance painters in the 1400s were experimenting with perspective and with finding the vanishing point, Persian miniature painters were experimenting with pattern and composition, designed to move the eye around the picture plane. Islamic miniatures combined non-figurative ornamental decorations with intricately rendered human characters in a seriously stunning way. Kamal ud-din Behzad was particularly skilled at depicting natural and organic human movement in his works, and achieved creative ways of communicating narrative and characters. The private nature of miniature paintings also meant that he could include playful details that would take the viewer a longer time to find. There’s not much, unfortunately, as relatively little is known about the details of Kamal ud-din Behzad’s life. What we do know is that he was born in Herat (a city in modern western Afghanistan) and became an orphan at a very young age. He was raised by a prominent painter, Mirak Naqqash, who taught him how to create art that would appeal to high society patrons. He rose to prominence when he showed talent and impressed Herat’s prime minister, Mir Ali Sher Nawa’i. When he began painting storylines from famous books of poetry he also caught the attention of Hussain Baeqra, the Sultan of Herat. After this, his works were bought by royal patrons and displayed at the palace. Later in his life, he became director of the royal atelier for Shah Ismail I Safavi in Tabriz. His tomb is located north of Herat. This is Kamal ud-din Behzad’s most famous work. It’s based on the Quranic verse of Yusef and Zuleykha, a love story retold in many different versions. It’s interesting to note the artist’s use of perspective here. The right hand wall shows his skill at depicting realistic-looking perspective, but he makes the stylistic choice to flatten most of the image. Instead he uses patterns to creatively differentiate the rooms and structures of the house. Meanwhile, the two figures inhabit this fantasy space with highly naturalistic and flowing gestures. While miniature painters usually used architectural elements to create their compositions, Kamal ud-din Behzad was equally adept at painting landscapes. In this image, distance is not suggested through a vanishing point but by layering different planes of patterned field. In miniatures, placing an object higher up in the image usually indicated that it was further away. The presence of an ornamental border here gives us an idea of how it was supposed to be displayed in a book or album, rather than as a large and illusionistic painting or wall mural. Apart from giving some more great examples of architecture and how perspective is created, this painting also illustrates Kamal ud-din Behzad’s ability to create personality and narrative. His figures and their gestures are filled with character and movement. In an unexpected detail, a man can be seen peering through down at the scene in the red window box. If I could, I would go to Golestan Palace in Iran, as some of Behzad’s paintings are preserved there. 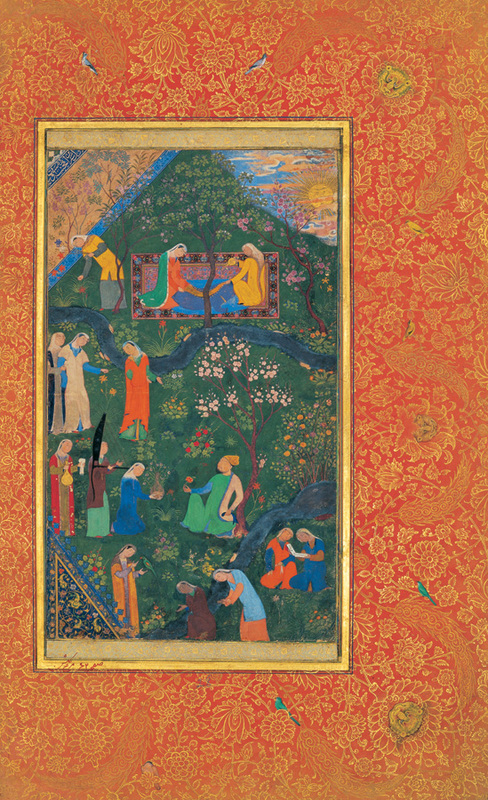 Thomas Lentz, “Changing Worlds: Bihzad and the New Painting,”pp. 39–54 in Persian Masters: Five Centuries of Painting, 1990. David J. Roxburgh, “Kamal al-Din Bihzad and Authorship in Persianate Painting,”pp. 119–146 in Muqarnas, Vol. XVII, 2000. Loved this arrival.Would like to know more about miniature art.